*Separate the eggs carefully; even a small amount of yolk in the whites will prevent them from beating up properly. In a large mixing bowl, beat the egg whites with the cream of tartar or lemon juice until foamy. Gradually add 1/2 cup of the sugar and continue beating until stiff and glossy. Set aside. Whisk together the remaining 1 cup sugar with the flour, baking powder and salt. In a separate bowl, beat the oil, milk, egg yolks and flavorings until pale yellow. Add the dry ingredients and beat until well blended, about 2 minutes at medium speed using a stand mixer, or longer with a hand mixer. To assemble the cake (if you've made a tube-shaped cake), cut a 1-inch slice off the top of the cake, and reserve it. Slice a 3-inch-deep ring out of the middle of the cake, leaving 1-inch walls on each side. Pull out pieces of the cake to make a 3-inch "trench" in the cake. Don't cut through to the bottom of the cake. Fill the trench with chocolate filling. Place the top back on the cake and refrigerate it until ready to frost. If you've made round layers, simply spread the filling on one layer, and top it with the second layer. The cake should be made at least 4 hours before serving to allow time for the center to set properly. To make a lemon chiffon cake, use lemon extract instead of vanilla extract and almond flavoring, and add 2 tablespoons grated lemon rind. Or substitute 1/2 teaspoon lemon oil for the extract and peel. For a chocolate chiffon cake, decrease the flour to 1 3/4 cups, and mix in 1/3 cup Dutch-process cocoa. Also, use buttermilk for the liquid, if you have it; it'll give you the most intense chocolate flavor. 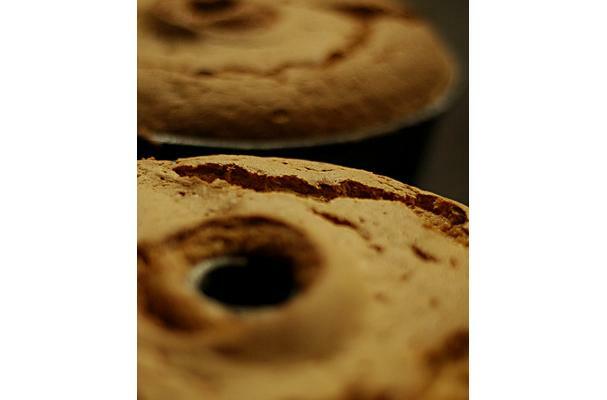 Chiffon cakes may be baked either in tube (angel food) pans, or in 9-inch round cake pans. Like an angel food cake, they must be cooled upside down to maintain their full height.